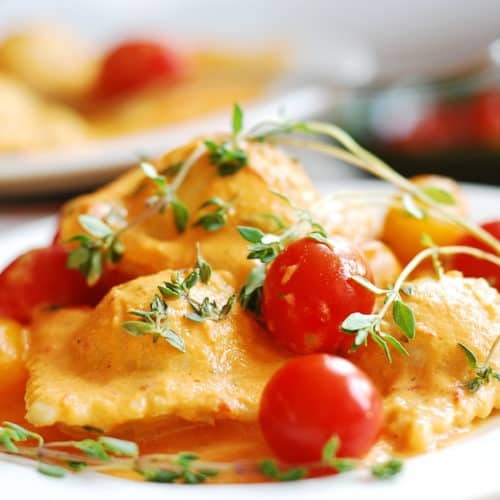 Ravioli with spinach and ricotta cheese filling, in tomato cream sauce – meatless, Italian style pasta dish, with everything made completely from scratch! Learn how to make ravioli dough from scratch, how to shape ravioli, what filling to use and what sauce to make. 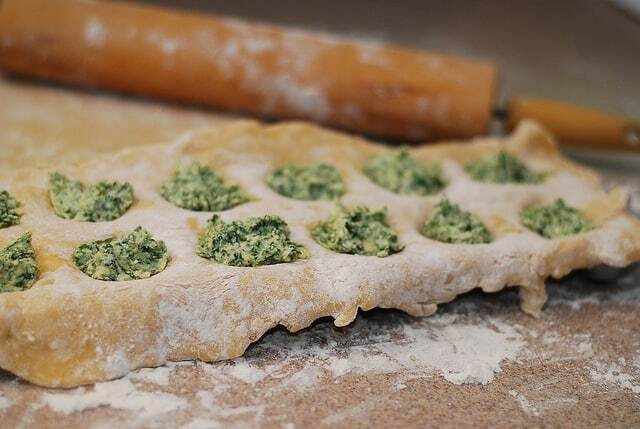 Detailed instructions and step-by-step photos to show you how to make the ravioli with spinach and ricotta cheese filling at home! I was originally planning to post a light-hearted and easy recipe about how to make a yummy plum drink, but I changed my mind and instead I took an endeavor of making fresh pasta ravioli from scratch. So I made super delicious spinach ravioli with ricotta cheese filling in a creamy tomato sauce. Here is my recipe featured on SeriousEats Weekend Cook and Tell: Fresh Pasta. Very exciting! Even though the below recipe on how to make ravioli has many steps, making fresh pasta ravioli is actually pretty easy, especially because you have a very detailed tutorial that I created below. 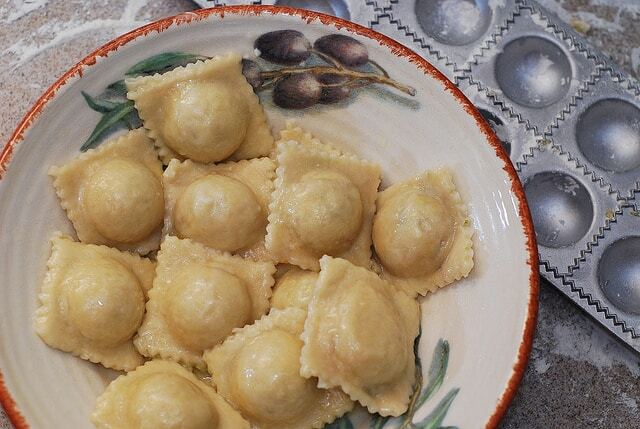 I have created and tested the below recipe, to make sure I have the exact proportions for the ravioli dough (pastry), so if you follow my steps precisely, you will create a wonderful ravioli dish that will impress your family and/or guests. The most important part here is to roll your ravioli dough very thinly – that’s the secret to great tasting ravioli! To roll it thinly, the dough should have just the right proportion of water to flour, which I denoted in my ingredients section below. It is important to let ravioli dough sit for an hour, covered in plastic wrap, so that the gluten does its job, and the resulting dough is nice and elastic enough for you to work with. And, finally, I think it’s great to learn how to make your own ravioli, because then you can endlessly experiment with fillings instead of just buying what grocery stores offer you. I am personally never impressed with the selection of pre-made ravioli in stores, so that’s primary reason why I learned to make my own. First, make the ravioli dough according to the recipe instructions below and let it sit for 1 hour. Stir water with egg until well mixed. In a bowl, combine flour and egg-water mixture together and mix until well incorporated. Knead the ravioli dough until well-textured and firm. The dough should not be too wet or too sticky. It should only stick to itself, but not to your hands. However, it should not be too dry, either. Make the dough into a ball, cover with plastic wrap. Let the ravioli dough stand for 1 hour at room temperature before using. This allows gluten to work. Heat olive oil on medium heat, add spinach and cook covered, stirring occasionally, until spinach wilted, about 15 minutes. Cook for 5 or 10 more minutes uncovered until all liquid evaporates. Chop cooked spinach finely and move to a bowl. Add Parmesan cheese and ricotta cheese, salt to taste and mix well. Add more salt if necessary. Divide the ravioli dough (instructions on how to make ravioli dough from scratch are above) into 2 equal halves and roll each half into a very thin sheet with a rolling pin. Make sure to have flour on hand and dust the working surface or rolling pan when necessary, because the dough will be sticky. 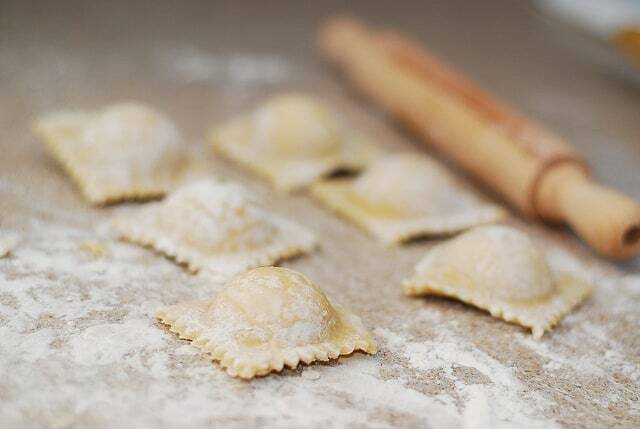 It’s important that the ravioli dough be rolled very thinly (paper-thin), otherwise ravioli will be too solid when cooked, because dough expands during cooking. Also it will be really hard to use the ravioli mold if the dough is not thin enough. 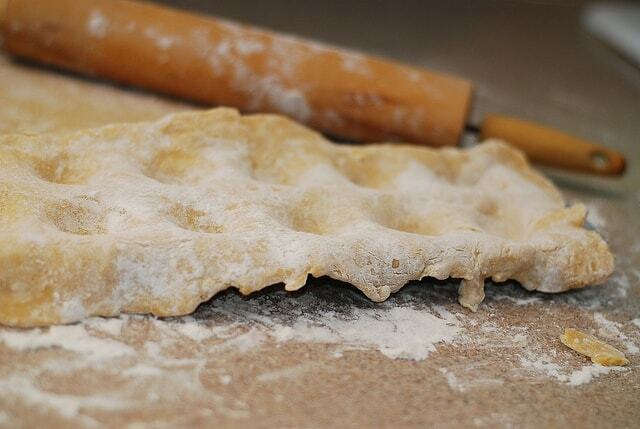 You can take the scraps of the dough and add them to your covered dough for future rolling. When you are done shaping ravioli, bring a big pot of water to boil, add ravioli and cook for 5 minutes, then drain. Or, alternatively, freeze ravioli until you’re ready to cook them. Heat olive oil in a pan over medium heat. Chop tomatoes and garlic and add to the pan. Cook covered for about 10 minutes until tomatoes soften. Add white wine and chopped thyme. Bring to boil and cook uncovered for 5 more minutes until half of liquid evaporates. Remove from heat, let it cool for a bit. 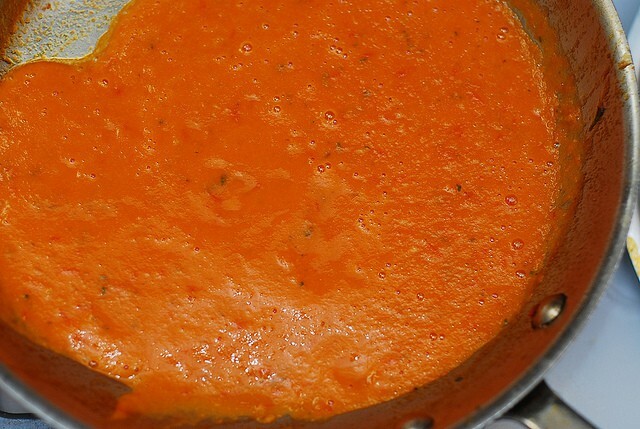 Then transfer to blender and puree the tomato mixture. Transfer the puree back to the pan, reheat to medium heat and add heavy cream. Stir until well incorporated. 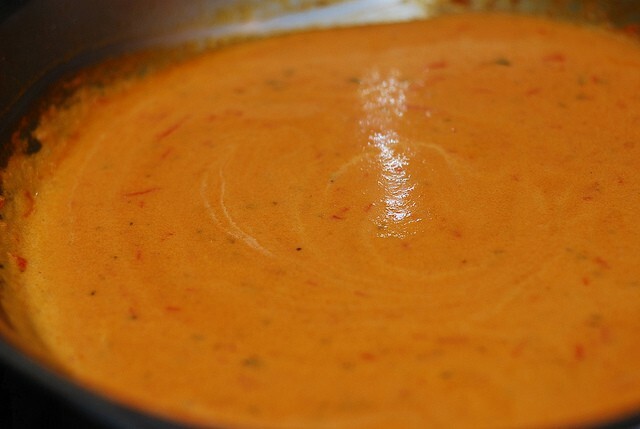 Cut each grape tomato in half and add all of them to the pan with the tomato cream sauce. Salt to taste and and more chopped thyme if needed. Cook for 5 more minutes. To serve, add cooked ravioli to the sauce at the last minute. Allow both ravioli and the sauce achieve same temperature. When serving on plates, garnish with thyme. 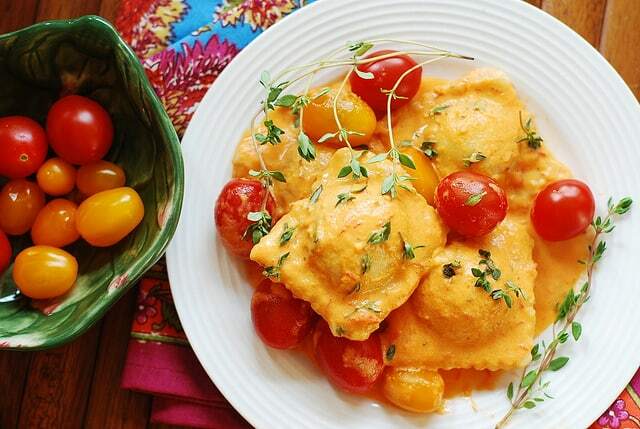 Homemade ravioli with spinach and ricotta cheese filling, smothered in a creamy tomato sauce. Learn how to make ravioli dough from scratch, how to shape ravioli, what filling to use and what sauce to make. 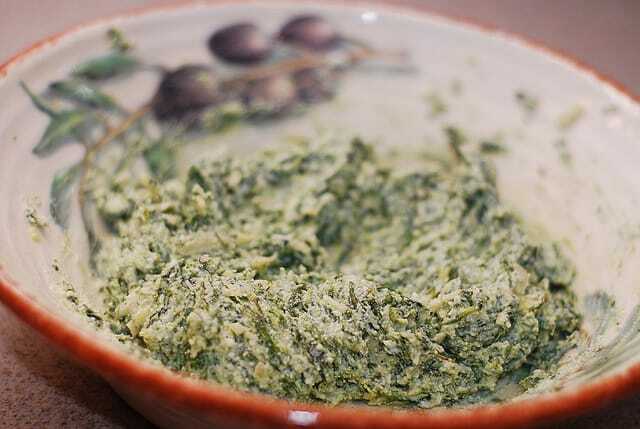 Detailed instructions and step-by-step photos to show you how to make the ravioli with spinach and ricotta cheese filling at home! In a bowl, combine flour and egg-water mixture together and mix until well incorporated. Knead the dough until well-textured and firm. The dough should not be too wet or too sticky. It should only stick to itself, but not to your hands. However, it should not be too dry, either. Make the dough into a ball, cover with plastic wrap. Let the dough stand for 1 hour at room temperature before using. This allows gluten to work. 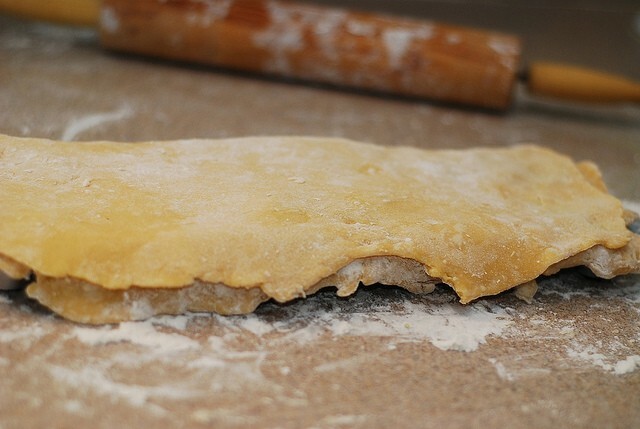 After the ravioli dough has been resting at room temperature for 1 hour, divide the ravioli dough (instructions on how to make ravioli dough from scratch are above) into 2 equal halves and roll each half into a very thin sheet with a rolling pin. Make sure to have flour on hand and dust the working surface or rolling pan when necessary, because the dough will be sticky. 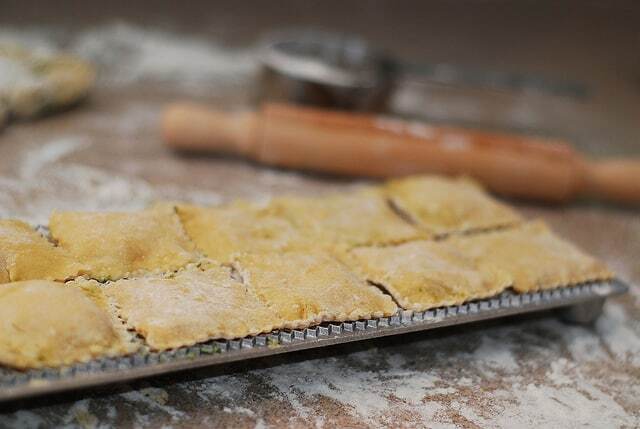 It’s important that the ravioli dough be rolled very thinly (paper-thin), otherwise ravioli will be too solid when cooked, because dough expands during cooking. Also it will be really hard to use the ravioli mold if the dough is not thin enough. Once you rolled sheets of dough, shape individual raviolis. 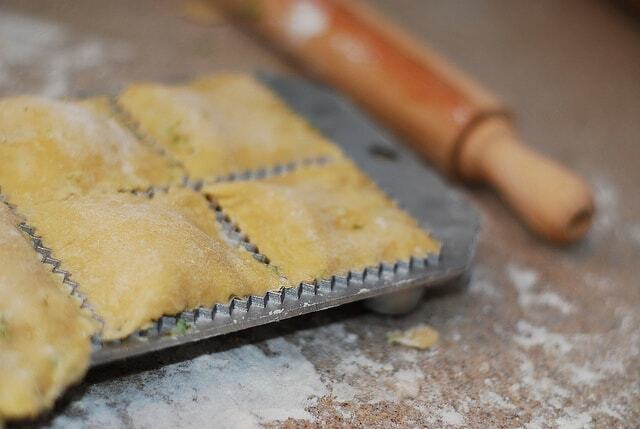 To shape ravioli, I use a very handy device, ravioli mould/tray, which works great! Step-by-step photos are above the recipe box. Heat olive oil in a pan over medium heat. 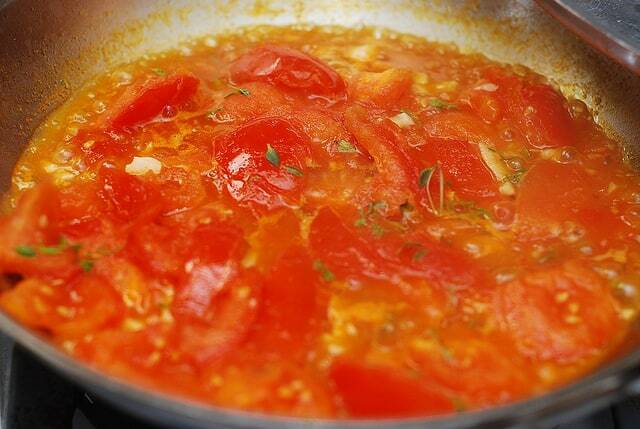 Chop 2 tomatoes and garlic and add to the pan. Cook covered for about 10 minutes until tomatoes soften. 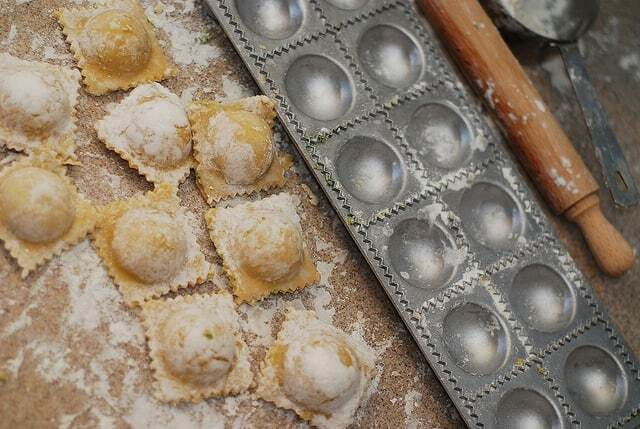 The recipe for ravioli dough makes enough to make dough for 12 raviolis, using the mold (ravioli mold makes 12 ravioli). Is it possible to make the dough ahead of time and keep it in the fridge for few hours? Allow the dough sit for 1 hour first, per recipe instructions. Then, you can wrap it airtight in plastic wrap and refrigerate it. Bring the dough to room temperature before making ravioli. But, the best way would be to make ravioli first, and then refrigerate ravioli before you’re ready to cook it.